See the data you need to make strategic decisions and plans. You’ve got a handle on creating feature items (requirements, features etc…) and now you find yourself wanting to evaluate and approve these items. The next step is easy. The prioritization tool in OneDesk allows you to evaluate your established requirements. Simply weight the properties you’ve given them according to your current business goals. This gives them a numeric Global Score which you can compare, approve the items and move them onto the next stage. Creating a product roadmap from scratch can be long and complicated, but with OneDesk, your product roadmap is generated as you go. As you create your projects, add items and schedule tasks, a roadmap timeline is automatically created. 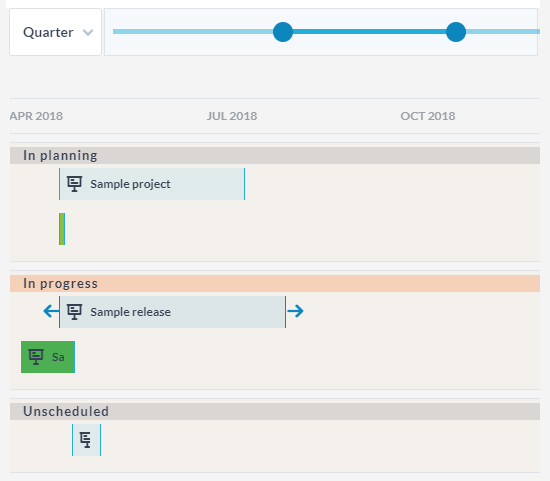 Simply click on the Roadmap Timeline or Roadmap Gantt to see your progress. You can also add in milestone markers and any other objectives along the way from the top + button and they will appear automatically on the roadmap.